Rover Oaks Pet Resort is preparing to launch its fifth annual month-long donation drive, Operation: War Dogs to support non-profit organization Mission K9 Rescue, the Houston chapter of the United States War Dogs Association (USWDA). The drive officially begins on Memorial Day and ends on Independence Day, July 4, 2015. Since 2011, Rover Oaks Pet Resort and Operation: War Dogs have raised over $40,000 for United States War Dogs Association. Mission K9 Rescue is a non-profit organization dedicated to the service of retiring and retired Military Working Dogs and Contract Working Dogs. 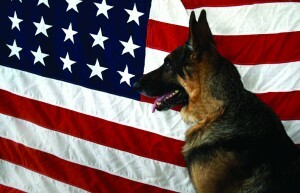 They provide monetary, transportation, adoption, and professional assistance for these retired hero dogs. Over the past year, Mission K9 Rescue has reunited many hero dogs with their handlers, and worked tirelessly to find adoptive homes capable of meeting the needs of a retired military working dog. Videos of some of these reunions can be viewed on their website. During Operation: War Dogs, donations will be accepted at Rover Oaks Pet Resort in Houston near NRG Stadium and Rover Oaks Katy near Katy Mills Mall. Donations can also be made via PayPal online at roveroaks.com/wardogs. Rover Oaks will give a free night of lodging at their facilities to every donor who contributes $100 or more. Donations of $25 will receive a commemorative army dog tag necklace or USWDA bandana. In addition, Rover Oaks will decorate their facilities with patriotic paw prints presenting the names of the clients and community members who contribute to Mission K9 Rescue. Every dollar counts and anyone interested in donating is encouraged to stop by either Rover Oaks location to make a contribution in their name or in honor of a soldier or war dog they wish to recognize. Today, all branches of our armed forces are utilizing Military Patrol Dogs specializing in drug and bomb/explosive detection. Many people don’t know that there are literally thousands of these dogs that have risked it all in the protective service of our military personnel. Our military service dogs have worked to detect bombs, drugs, weaponry and much more. They deserve a chance to rest and play as they move on from their service, and your donation to Operation: War Dogs will make that possible. Donations will be accepted at either Rover Oaks location, or online at roveroaks.com/wardogs. Rover Oaks hopes to raise $15,000 for Mission K9 Rescue by July 4th. Follow Rover Oaks’ Facebook page for updates on this goal. Mission K9 Rescue is a 501(c)3 Non-Profit Organization and donations are tax deductible to the extent allowed by law. Rover Oaks Houston, 713-662-2119, is located at 2550 West Bellfort, Houston 77054. Rover Oaks Katy, 281-693-7687, is located at 24250 Kingsland Blvd., Katy 77494. To learn more about Rover Oaks or for directions, visit www.roveroaks.com. For more information on Mission K9 Rescue, visit missionk9rescue.org. For every situation, there is a quote.